With all of the new technology surrounding business in today’s society, brainstorming seems to be dropping off the radar—not because it isn’t effective, but because our minds are so used to the fast-paced and tech-centered way of life we don’t always take the time to do it. Brainstorming by definition is a group or individual creativity technique by which efforts are made to find a conclusion for a specific problem by gathering a list of ideas spontaneously contributed by its members. But what happens when you can’t think of ways to successfully brainstorm? Since we know time is precious, we have listed some practices we employ at Avalon Communications below. Use a whiteboard: We know, basic right? But you would be surprised at how much it helps to see things written down clearly on a board. By organizing your thoughts on paper (or board) you can better organize them in your mind. Start thinking individually, then move into a group: It is better to think of your own ideas first, write them down and then share with the group. This not only streamlines your efforts, but you can see what others are thinking- giving you a new perspective on the issue at hand. Sometimes another member may have the same idea, but with a different angle- making for a great brainstorm! Put some crazy ideas out there: Sure, they may be unreasonable and unrealistic, but it may spark another member’s mind to come up with something great! No Judgment: No one likes to have their ideas thrown out the window. Make brainstorms a judge-free zone so everyone feels comfortable sharing their thoughts. Listen: Most importantly you need to listen to other’s ideas. Do not just over-rule their ideas because you think you have a better one. Work together as a team! These are just a few ways we find to be very successful in the workplace and hope they help you come up with some great ideas! Have some brainstorming tips of your own? Comment below! Don’t forget to Follow us on Twitter and Like us on Facebook! Use #Brainstorm to submit tips! At Avalon Communications we value the importance of giving back to the community and being based in Austin gives us many opportunities to do so! 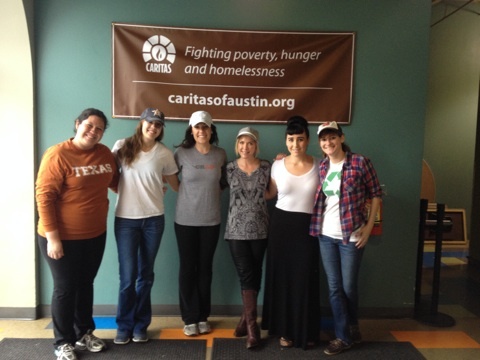 This week, we chose to help out at the CARITAS Kitchen in Downtown Austin, Texas. CARITAS is a non-profit that serves over 20,000 people each year whose opportunities have been diminished by poverty and homelessness. They serve households of all sizes, many being those of refugees, veterans, women and children. They work alongside each and every one of these people to increase their stability and self-sufficiency regardless of the clients’ past experience and future goals. Every week day, CARITAS staff members and volunteers help prepare and serve lunch to those in need. This Wednesday, several of us at Avalon were happy to be a part of the CARITAS kitchen! We had the help of the wonderful CARITAS staff members as well as students of the Escoffier School of Culinary Arts in Austin to guide us through kitchen prep, food service and clean-up for 320 people. At 9 o’ clock sharp it was all hands on deck! We helped prepare the food, learned some very interesting kitchen facts from our knowledgeable mentors and in no time, it was time for lunch. The food looked delicious (and tasted even better according to those who came through the door) and the company was delightful. We know after reading about our experience at CARITAS you may be wondering what you can do to help. They are always looking for volunteers and it’s easy to sign up- follow this link. This experience not only gave us a great opportunity to help those in need, but also bond with our co-corkers as well as our city! Want to see pictures from our day at CARITAS? Check out our Facebook Page. Where do you like to volunteer? Share with us on Twitter! Time management is a phrase commonly used in resumes, interviews or maybe on a poster in your office- but do the people that use this phrase really understand its meaning and practice it in the workplace? In business, time management is very important not only for your personal benefit but for your co-workers, clients and anyone else you interact with. Do you give yourself enough time to complete your tasks? Do you prioritize them based on deadlines? Do you allow room for interruptions that may occur? If you answered ‘no’ to any of these questions, you may need to improve your time management skills. It is understandable that some may not know where to start when it comes to time management- so we have listed a few key practices that will help below. Prepare for interruptions: As a professional, interruptions happen- sometimes good, sometimes not so good- but you need to be ready for them. A deadline does not change just because a conflict came up and you will still be expected to finish your work. Plan Ahead: If you have a reoccurring commitment like a meeting every Wednesday you should always plan around that. You know it is going to happen, so there is no excuse if you forget to fit it into your schedule. 30 Seconds or Less: When handed a new task, ask yourself if it can be completed in 30 seconds or less. If so, go ahead and do it! If not, write it down on your To-Do list and complete it when you can. Be Organized: There is no greater way to waste your time than by being unorganized. Take the time to make sure everything is easily accessible, filed correctly and in order— your life will be much easier as will your work day. These are just a few of the strategies we employ at Avalon Communications as we know that time is precious for both our clients and the media. How do you manage your time in the workplace? Comment below! In business, most communication happens via email- which is why proper email etiquette should be something every company practices. An email is the starting point of communication for many professionals- and to get past the first “introduction” step of communication certain steps must be taken. At Avalon Communications, we value our clients as well as our media contacts, and to us, email is a very important form of communication. Below are some points that we strive for in each correspondence. Turnaround Time: Always respond to an email in less than 24 hours. This not only shows that you are paying attention to the recipient but that you are readily available for what may come up. Proper Greeting: Always double check who you are sending an email to, and make sure it correlates with the salutation. (There is nothing worse than calling someone the wrong name). Grammar: As a professional, grammar is key. If you misspell a word, or worse, the recipient’s name- they may delete your email without hesitation. Always use spell-check. Attachments: If you say in the body of your email that you have added an attachment, make sure it is attached. As you form relationships via email, you may notice that certain people format emails in certain ways, or like different types of responses; some may like you to get straight to the point (especially if they need information asap) while others may like a more conversational tone. These are just a few tips on how to receive greater response via email as well as form greater bonds with those you are communicating with- if you have any other tips comment below- we would love to hear your thoughts!